Duren works in Administrative Information Systems, which is part of Campus Technology Services. AIS Director Benjamin Chang explained that their department keeps Banner running, along with related projects, system security, integration, and updates. Banner is an administrative operations application suite that manages data including and related to student information, student accounts, finance, human resources, and payroll. Duren maintains the database that supports Banner and other applications (for student transcripts, W-2s, etc. ), grants new users access to data, and develops web applications, such as the student performance-tracking Early Warning System, a Title IX system, and Student Financial Document Upload System. 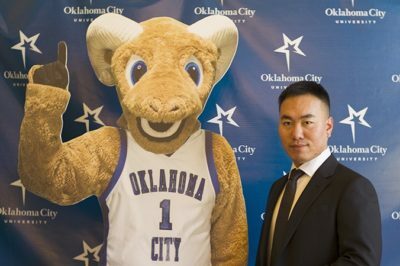 He has made, modified, or updated almost all of OKCU’s home-grown web apps, he said. He works in many programming languages. How did you come to OKCU? Duren started as an ELS English language student; moved into the computer science master’s program, which he finished in 2014; began working as a data analyst for Business Intelligence & Reporting in 2015; and then about a year ago, began working for AIS. Duren plans to graduate with his MBA in December 2018. Duren moved to Oklahoma from Xi’An Shaanxi Province, a big city in the middle of mainland China. He traveled throughout China during his undergraduate studies in electrical engineering. 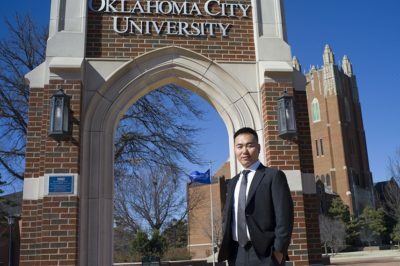 He wanted to explore a different culture, and he received an offer from OKCU. In his seven years in the U.S., he has crisscrossed the country. In contrast in China, people might judge others based on their house, car, job, and more, he said. He thinks it’s easier to be respected and accepted in the U.S. Through OKCU and travel, he wants to keep learning and refreshing himself. That also helps him meet new people and gain new perspectives, he said. He wants to learn instrumental music next, perhaps tackling piano. Duren has podcasted almost monthly since 2013, recommending all kinds of music, from opera to pop. The podcast is in Chinese, and it has 2,000–3,000 followers. He also sings karaoke a lot—to the extent he has his own machine with specialty speakers from Japan. “There are a lot of karaoke parties at my house,” he said.